Where can I get it cheap? The active ingredient that kills the adult fleas is called "fipronil." It's a topical insecticide that works by getting into the oils of your kitty's skin and hair follicles. The "Plus" part of this product is methoprene. Methoprene is an insect growth regulator (or IGR). It targets flea eggs and larvae and keeps them from maturing and reproducing. These two ingredients combined are very effective in breaking the flea life cycle. Fipronil continues to work even if your cat gets wet or is exposed to sunlight. However, methoprene is not effective if exposed to sunlight. This medicine kills 98 to 100% of adult fleas on your cat within 24 hours. It starts killing fleas shortly after the flea comes into contact with your cat's skin. There's no need for the parasite to bite your cat for the fipronil to work. Merial, themanufacturer, says that research shows that Frontline Plus kills adult fleas, flea eggs, and flea larvae for up to six weeks. It kills ticks for at least one month. It's recommended that the flea medicine be reapplied once a month where there is a high risk of flea reinfestation or where tick control is needed. You should not reapply it before 30 days. Here are the steps to properly apply this topical solution. The directions come directly from the manufacturer's instructions. Remove applicator from child-resistant package. Hold applicator upright and snap applicator tip away from face and body. Place applicator tip through animal's hair to the skin level between the shoulder blades. Squeeze applicator, applying entire contents to a single spot to the animal's skin. Avoid superficial application to the animal's hair. Only one applicator per treatment is needed. According to the product label at the manufacturer's web site, this medication can be used on kittens 8 weeks and older. 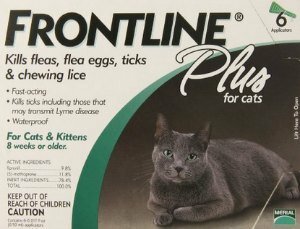 This is a little strange, since the product label for Frontline Top Spot says not to use on kittens under 12 weeks of age. Frontline Top Spot contains 9.7% of the active ingredient fipronil, while Frontline Plus contains 9.8% of this flea insecticide, and 11.8% of methoprene. It's probably best to consult your veterinarian when using Frontline products for kittens, or use Advantage Flea Control, which is safe for kittens as young as 8 weeks old. The area where you apply the topical solution on your cat may appear wet or oily for up to 24 hours after application. This is normal, but don't touch the area until it's dry. If you accidentally touch the area, be sure to thoroughly wash your hands with soap and water. According to the product label, "individual sensitivities, while rare, may occur after using any pesticide product for pets. Pets may experience some temporary irritation at the site of product application. If signs persist, or become more severe within a few days of application, consult a veterinarian immediately. Certain medications can interact with pesticides. Consult a veterinarian before using on medicated animals. Consult a veterinarian before using this product with other pesticides. This product may be harmful to debilitated, aged, pregnant, or nursing animals; consult a veterinarian before using." This insecticide is now available without a prescription. You can buy Frontline Plus in 3, 6, and 12 dose packages directly from many pet supplies stores and online. Amazon carries all the conventional flea control products at a big discount. Only Natural Pet Store is my #1 recommendation for effective, natural flea control products. If you decide to go natural, this is the place to go.